One of the best feelings in the world is the onset of Spring and Summer. Of course the world is awakening, but what is almost as important is that the evenings are getting lighter. Woo Hoo! Because of this and for no other purpose that I could divine. 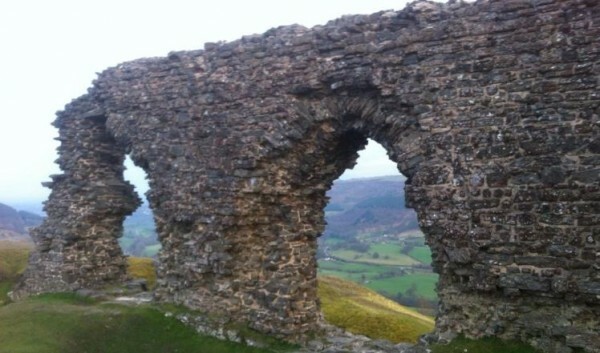 Gwas and I ventured forth to a nearby sacred place – which you should be very familiar with – Dinas Bran. Is there anything that I can do that would be of benefit to this place and or the beings inhabiting it? The answer was a disappointing no. I would have loved to give back in some way to Bran. It was a spirit of great giving. But there was no requirement or need. Thus came my second question. Was there anything I could learn about my Elemental Quest from Bran? The answer was a surprising Yes and so with some delight I asked whether there was a place for me to prepare and indeed, was there any need to do so. Yes and Yes. So off I trundled and was led to the seat (see above image). After a few minutes sat there enjoying the setting sun, I felt that I was ready to move on. 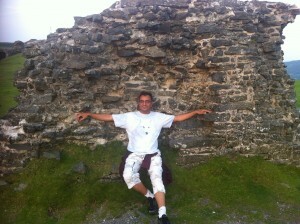 The dowsing rods then took me to one of my favourite places amongst all the sites we visit. I like to call it the Seat of the Energetic Double. In the picture below, it is the left hand window. I sat down and awaited the pleasure of the Genius Loci aka Bran. It wasn’t long before commune ensued and I asked regarding my quest. I have to note that I must do a post on commune, because it’s difficult to describe the process and to give a good image of what “commune” means and entails and feels like. For instance, when I just said (above) that “I asked…” it wasn’t exactly like that. It was more that Bran read what was in my thoughts and from the answer he/it gave it seemed that I had asked the question I wrote above. Makes sense? No? Good. Let’s continue. Bran, in his wisdom gave me the understanding that the Four Elements. Earth, Water, Fire and Air would not be obtained in this land. They would be found overseas. What!?! Really? Oh bugger! And that was the extent of his input. Drop a bombshell and vanish.